I make ok quiche, but it wasn’t until I had real quiche made by my French friend that I realized how sadly American my quiches have been. Behold! 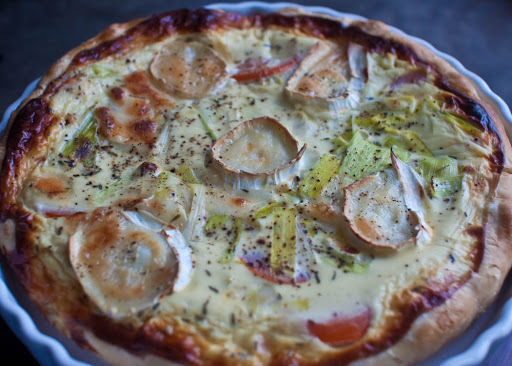 Leek, tomato, and goat cheese quiche! 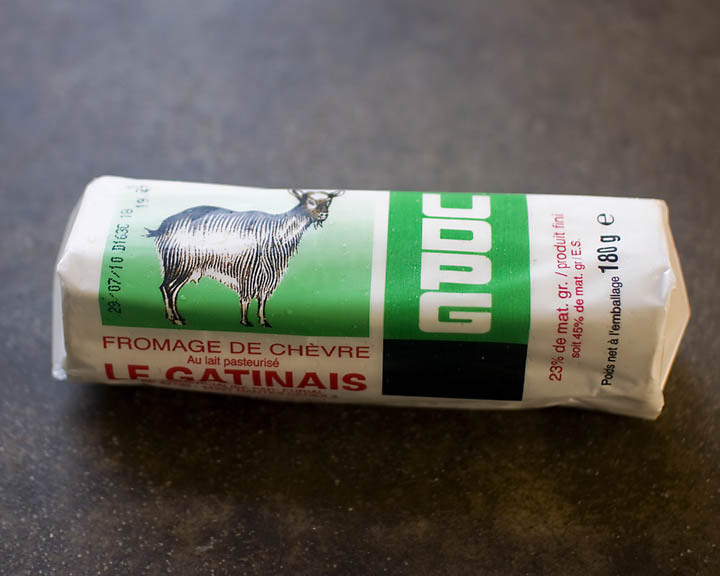 You will need goat cheese! Cut 5 generous slices for the top of the quiche, then chop the rest. Whisk together 4 eggs, about half to two-thirds of a container of creme fraiche, some salt, pepper, nutmeg, thyme, and honey. Stir in the chopped goat cheese. This was a real moment of enlightenment because I’d never considered using creme fraiche in place of milk or cream, and adding honey would’ve never occurred to me in a million years. Cut 3 large leeks into long slices, separate the layers, and sauté in a bit of olive oil, until they begin to soften; sprinkle with a bit of thyme near the end. 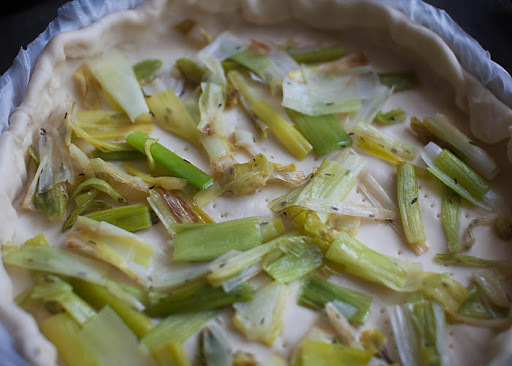 Mix about a quarter of the cooked leeks into the egg mixture, and scatter the rest around the bottom of a crust that’s been pressed into a tart pan. We used a pre-made roll & press crust. 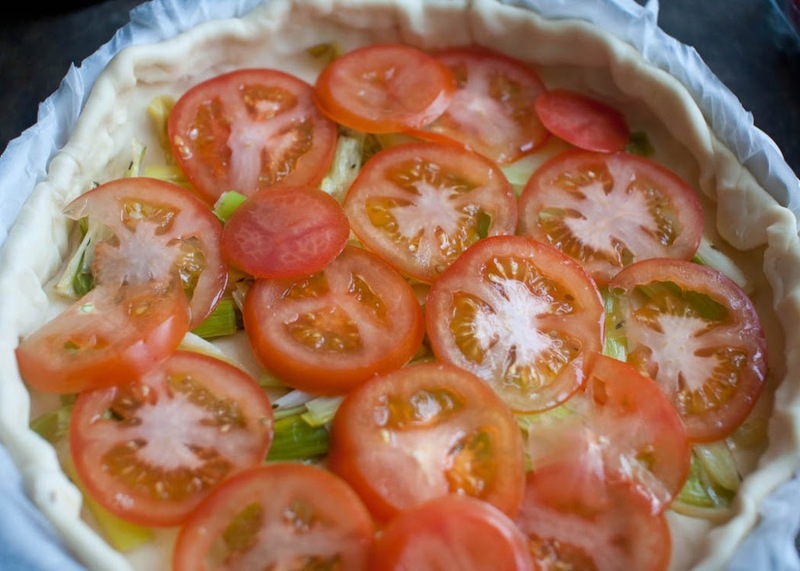 Cover the leeks with a thin layer of tomato slices. 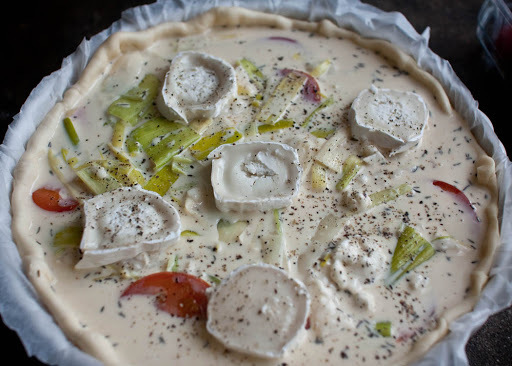 Add the egg mixture to the crust and top with the 5 slices of goat cheese. We baked it at about 400 degrees for around 30 minutes. But I’m baking in Celsius, so my actual temperature isn’t exactly 400, it was actually 200, and 400 degrees is the nearest whole number to that, so proceed with caution. This is a base recipe, the important things to remember are the 4 eggs and creme fraiche. Everything else can be varied. 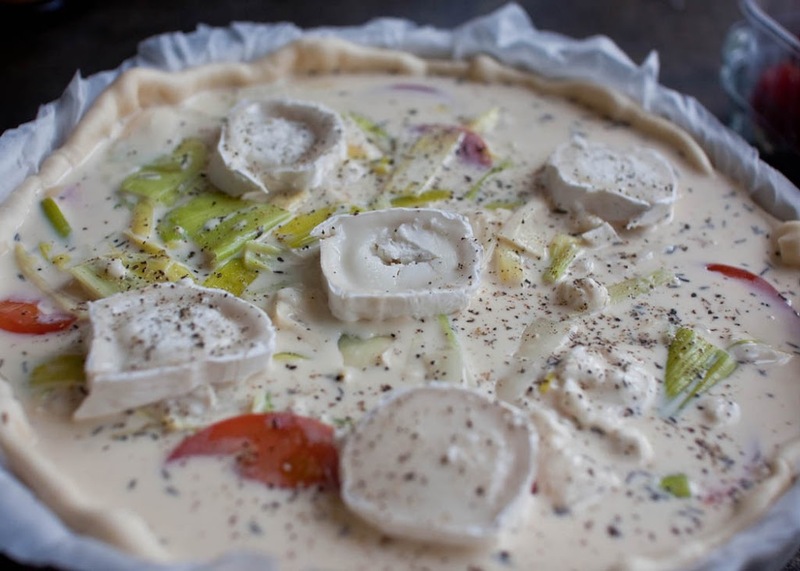 I’m already thinking about brie, Camembert, and different assortments of herbs and veggies. OMG It looks delish and I loveeeee goat cheese! Yum, that looks delicious! Agree that chef’s intuition can yield amazingly great results. When you say half a container of creme fraiche, can you estimate what size container (U.S. 8oz or pint)? Would half a container = 1/2cup in US measurements? Love your blog. We have so much in common. Did you receive my email?